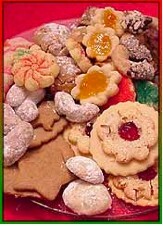 During this holiday season the last thing on your mind should be baking a wide variety of cookies. You have more important things to do… wrapping presents, planning Christmas dinner, making sure all the lights on the tree work... But at the same time you would like to be able to offer your Holiday guests a tray full of homemade goodies. To solve this problem and end the cookie chaos, try hosting a cookie exchange. Cookie exchanges are a convenient way to collect a wide variety of flavors, styles, and sizes of cookies. From bar and drop to pressed and rolled cookies, you can pick and choose your family’s favorites. Plus you can turn the exchange into a party that everyone will enjoy. So make a list of your best cookie loving friends and follow these tips from Rosemary Black, editor at the New York Daily News. Do the numbers: Ask each guest to bring a half-dozen cookies per person, plus an extra dozen. That means if you’re having 10 people, ask each to bring six dozen cookies. Each of you will take home 6 of each type of cookie, and there’ll be 12 left for tasting at the party. Another nice gesture is for everyone to bring an extra dozen or so cookies and make up plates of cookies for senior citizens who can no longer bake on their own. Set cookie guidelines: Nearly all types of cookies work well, though you may want to suggest that people avoid “no bake” cookies. Some tasters are squeamish about eating goodies that have been handled (or kid-handled) by dirty hands. And if you want to stick to a holiday theme, ask guests to stay away from chocolate chip cookies, too. Swap recipes, too: Remind your friends to bring copies of their recipe to share! It’s frustrating to taste a melt-in-your-mouth Mexican wedding cake or a sublime rum ball and then not have the means to go home and duplicate it yourself. Serve easy party fare: Your menu is a matter of individual preference. I’ve been to cookie exchanges where the hors d’oeuvres were unbelievably elaborate and others where the only thing served with the cookies is coffee. I like to put out cheese, crackers, fresh fruit, and maybe some salted nuts. Then after everyone has arrived and has sampled the non-sweets, we get to the main attraction: the cookies! With them, it’s nice to offer hot cider and cocoa, plus tea and coffee. Try a theme: For variation, consider asking everyone to bring a cookie that’s typically made in their country of origin. (Since I am Scottish, I often bring shortbread.) You could also have a party featuring cookies kids love, or cookies that are rolled into a shape and then creatively iced and decorated. Play some games: It’s also fun to plan some games, like Holiday Jeopardy. For instance, a sample question might be: “This well-known, indispensable reindeer accompanies Santa on his sleigh each year and has a very red nose.” The answer would be: “Who is Rudolph?” Telling guests in advance that you will be giving a prize for the most original (or funniest, or prettiest) holiday outfit encourages guests to come festively dressed. Make it moms only: I think a cookie exchange works best when it’s “girls only.” It’s better not to be distracted by children and husbands. If there’s any grumbling, tell your family (with a straight face, please!) that you need to try out all the cookies so you can recommend the best ones to them. They’ll have plenty of time to taste later.